It was just over a week ago that we laid my Dad's remains to rest and we all gathered as a family. We shared a meal and reminisced. Since coming home I have found my thoughts drifting back in time and so I went digging through old photos and I recently scanned some into my computer to share. The house we first lived in after our move to the Okanagan was in Coldstream, adjacent to Vernon BC. The Leclerc Colonial filled a small bedroom and I don't have any pictures of her set up. 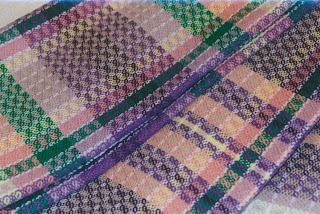 What I do have a picture of is the small loom I agreed to 'store' for the local weavers guild and eventually bought from the owner. 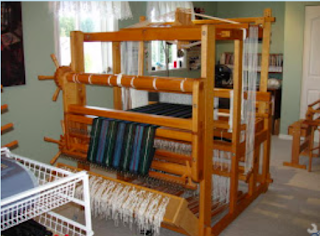 We lived on Tassie Drive and the loom was owned by Libby Tassie. Her husband's family had been early settlers in the area. It was a little slice of local history. 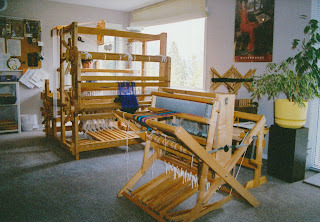 It was called the Tassie loom by everyone for obvious reasons, but what it actually was, was a thirty six inch Leclerc Artisat four shaft loom. 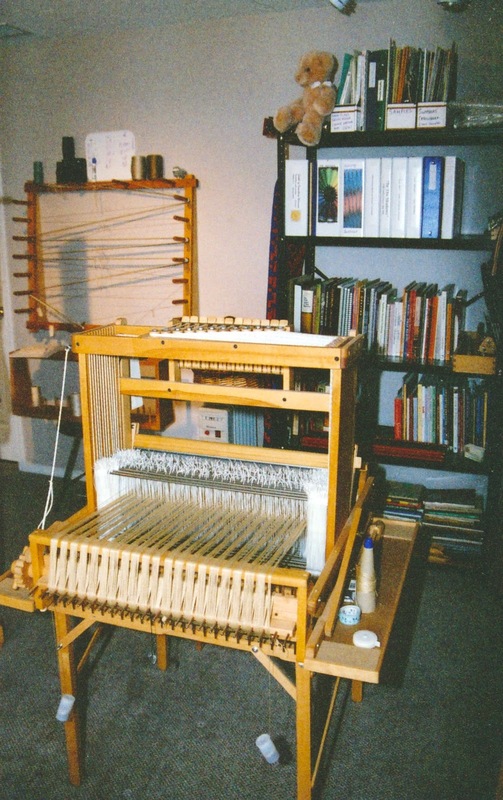 You can see that the "loom creep" was well under way with a loom in a bedroom and this little one was artfully angled in the large living room. The stash at this point fit well into a closet. We rented another home in a community called Winfield (later changed to Lake Country) and were perched on a hill above Gray Monk Winery's vineyards. There was a stunning 180 degree view of Okanagan Lake. 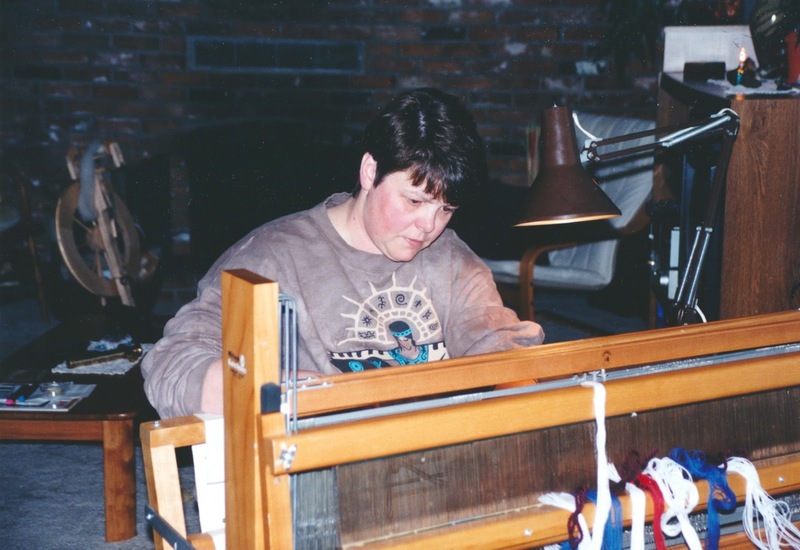 In July 1998 I received the brand new Woolhouse CM loom and so I sold off all the others to help pay for it. It was an eight shaft model at the time and the wood is so blonde for being newly made. 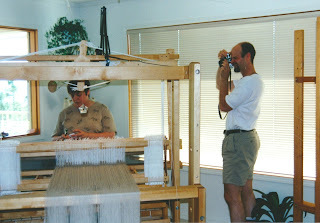 My brother Kent came for a visit and took pictures of me weaving on her. No bedroom for this baby! We placed her in the formal dining area and angled her so I could also see the lake and all its moods. Here I am weaving snowflake twill for the very first time in silk. Another move but this time we were buying a home and we moved to a small community called Estamont Beach on the north west side of Okanagan Lake. Here there was an above ground, walkout basement with a rec room and I set up shop there. The stash and associated equipment had grown (of course) and I used a small office downstairs to store things there. We were enjoying a new lake view once again, and the Woolhouse got the window, while a smaller eight shaft Leclerc Compact loom sat across from it. I bought the Compact loom from a dear friend who had woven many, many yards on her since she was new..... so much that she was actually wearing out! I was warned she was 'tired'! The loom needed some repairs and replacements and basically a reinvention of the tie up system as the slots for the cords had widened. 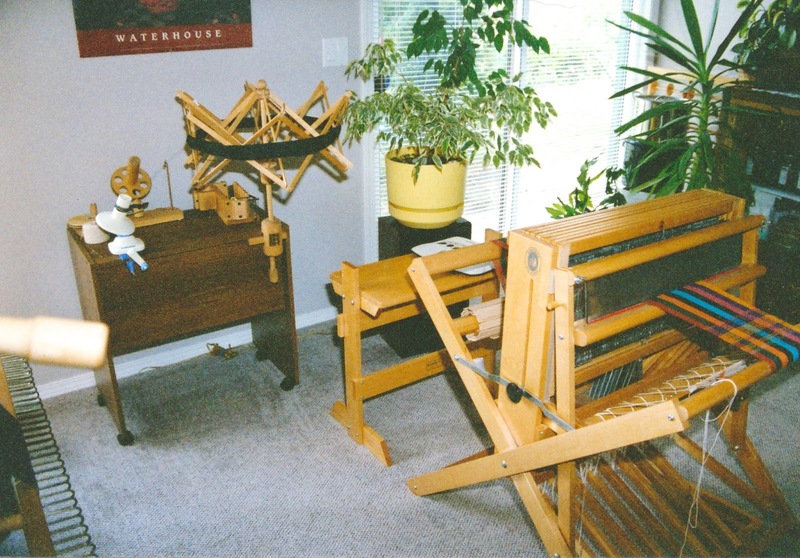 I struggled with it for a time and eventually sold it to a weaver in the Shuswap who's handy husband fixed the treadles and some other issues and she happily wove away on it. I found the loom was a bit too low for my height as well. New owner Jenny was of a more diminutive height than me. 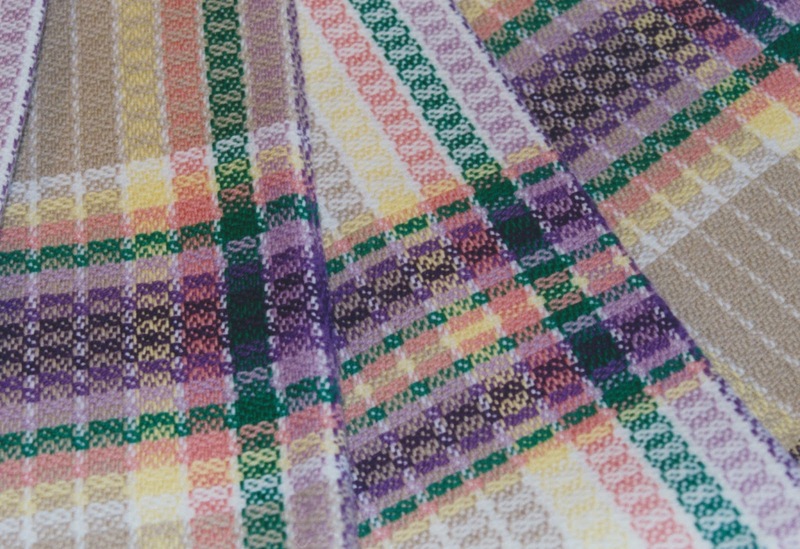 It just goes to prove that there is a perfect loom and weaver match for every loom and weaver! 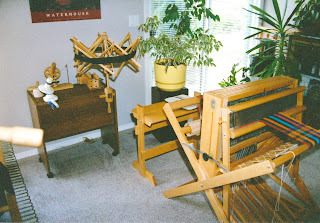 I had also bought a gently used 12 shaft Woolhouse Tools Carolyn table loom. It had only ever had one warp on it! I got the support table frame and it made it much more accessible for use. It ended up being too big and heavy for workshops, though it was really nice to stand weave when all set up over standing at a table all day. Eventually it was sold to Theresa of blog "Camp Runamuck" fame in Oregon and I believe she sold it in time to someone in Massachusetts. 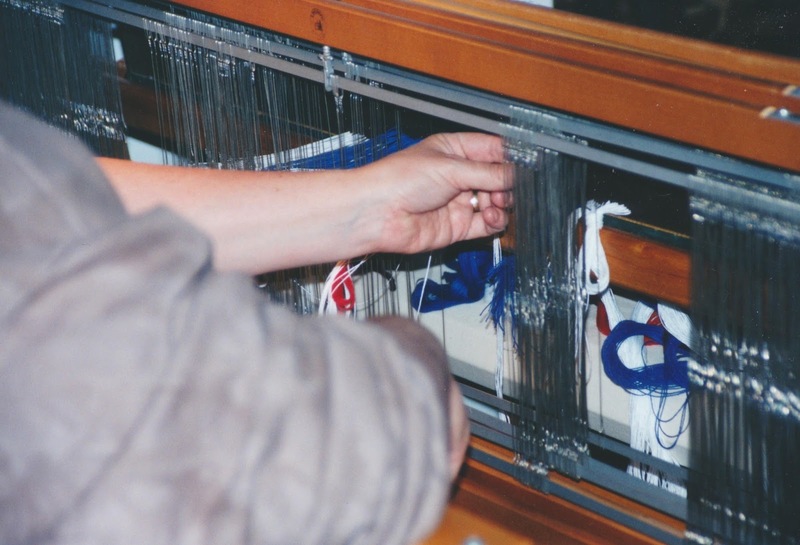 That loom certainly was going places! 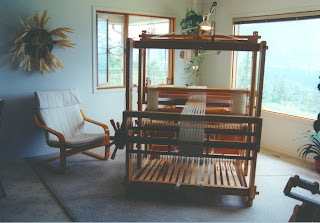 I love table looms for workshops and smaller projects, but if you are looking for speed, then it a floor loom all the way! 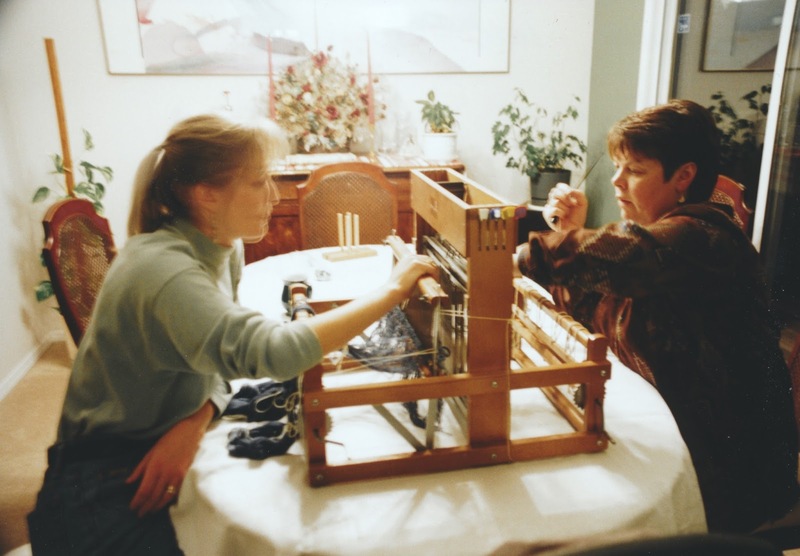 Having said that, here's a picture of me and a friend in 2003 working on a Leclerc Dorothy table loom. Julianne had found it in a local garage sale for $25.00 and thought she'd give it a try. Well, we worked it and finally got warp on her, but the heavy clunk action of the shafts and the slowness of the process meant Julianne had her own garage sale in due course. We moved to the Shuswap in 2004 to a larger home and the idea was to find a community that was more temperate. I was finding the long hot summers in the Okanagan really draining. You seemed to live in an AC house and run to your AC car. It was August when we moved in and it was 39 degrees Celsius. So much for that idea! The Woolhouse loom went to a small bedroom in the basement and stash and stuff went to the second bedroom down there. I can't find a picture of the room just now, but they were both bright and cheery..... but very small and I did not feel very inspired in those spaces. We literally had someone make us an offer on our home that we could not refuse! Retiring accountants from the Oil Patch in Alberta who wanted our house on the 13th tee of the golf course. So we packed up and moved again. 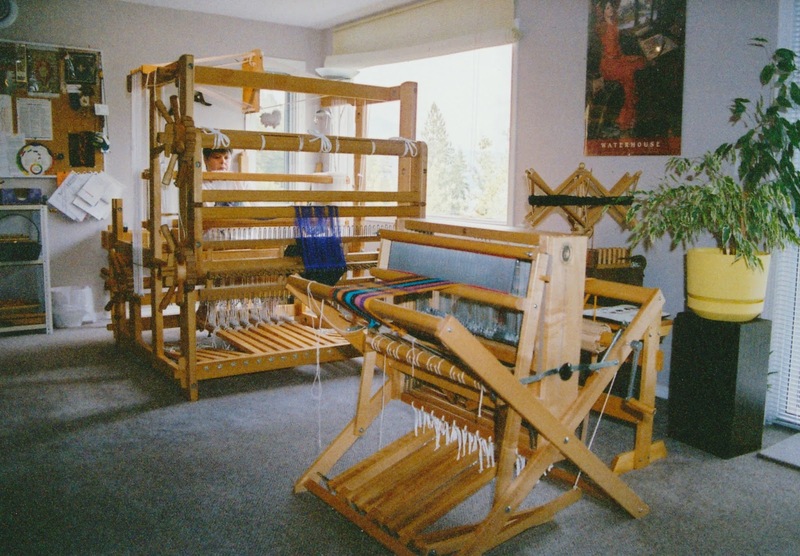 The Woolhouse loom and Carolyn table loom stayed in a very large bedroom with excellent light. 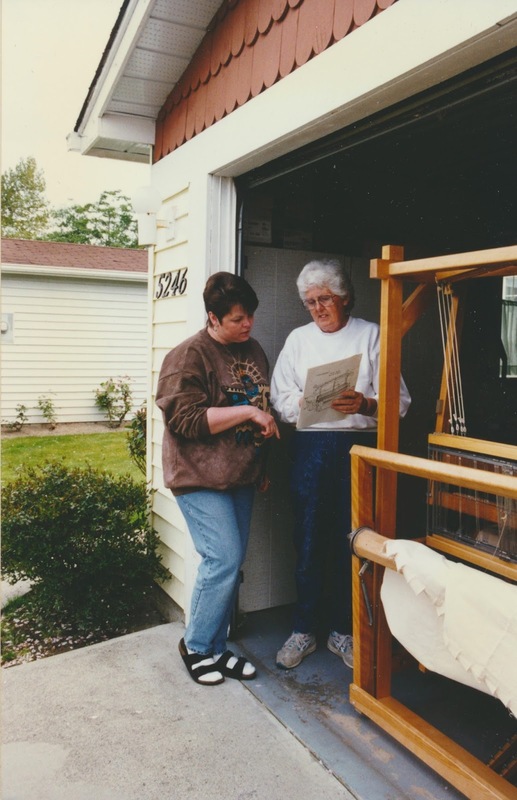 It was a nice space to weave in on the upper floor of our home. Our situation there in Powell River changed and we made a decision to move, with our home selling in 3 hours, and went to Vancouver Island in 2007 to our present home. 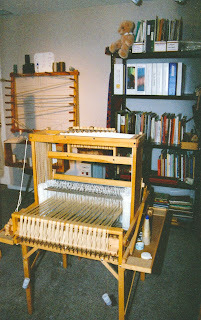 I had become very proficient at dismantling and reassembling (single handed too) the Woolhouse loom.... which continued to expand and grow over the years and that included to an addition of more shafts, a second warp beam and a 20+ tie up assist. There's one more move ahead for us and hopefully in 2016 we can sell this house when my recovery is well under way. Its time to downsize the size of property to look after. Our home has the main floor 'up' and so a flight of stairs are required to get to bedroom and essential rooms. Not ideal for someone with joint issues. I will still have another surgery to come even after the knee so the stairs will be an ongoing issue regardless. 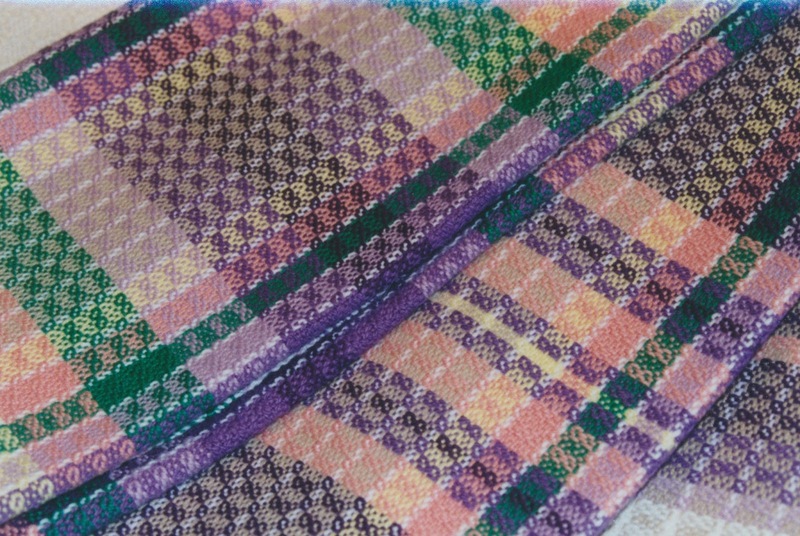 I also found some old photographs of past projects to share with you from 2003 - 2004 before I started keeping samples and better records. It took me a few years to see the sense in it! 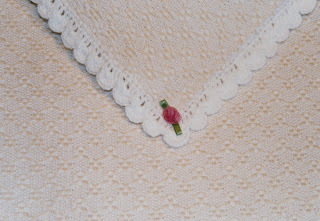 Baby Blanket: white 8/2 cotton with white #10 Aunt Lydia crochet cotton; hem stitched and hemmed. 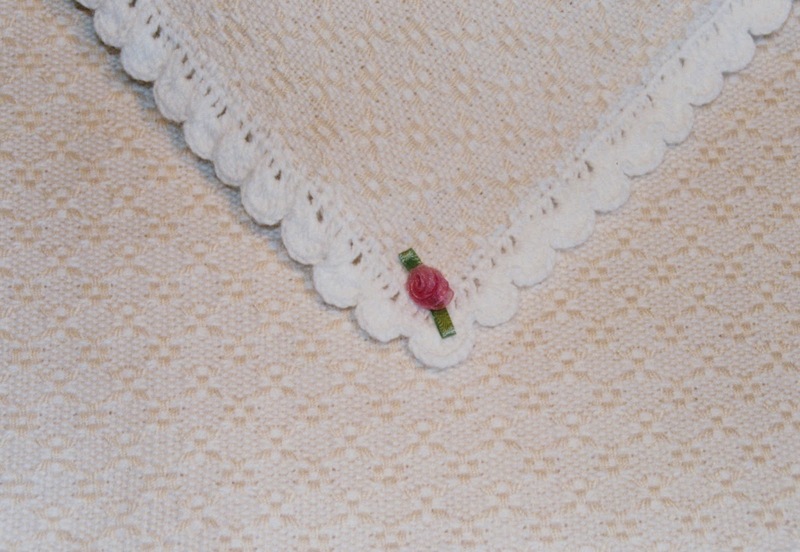 Baby Blanket: white 8/2 cotton with beige #10 Aunt Lydia crochet cotton; crocheted edging. I was a fairly new weaver still and looking for sources of yarns to use.... Aunt Lydia jumbo 1000 yard cones were then $5.99 at Wal-Mart. It gave the blankets a crisp pattern and lovely shine. I bought a few cones and still have them in my stash. Its nice to use actually. 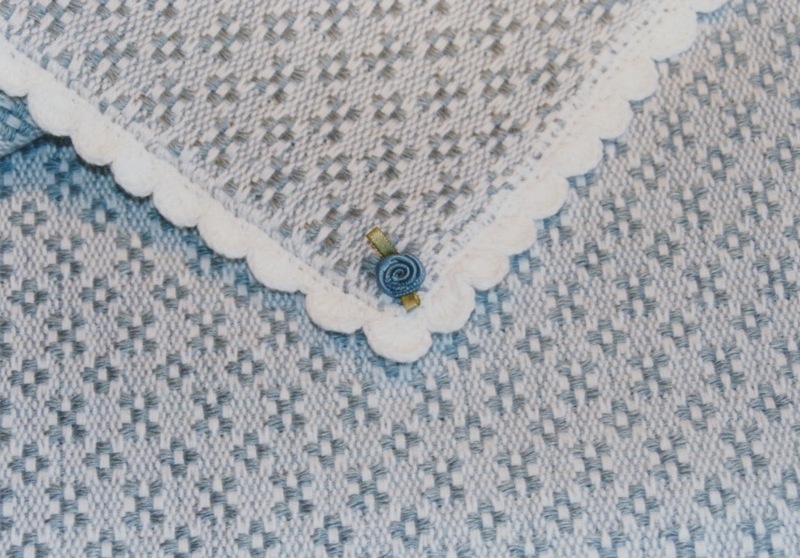 A dear friend Gloria, who is now long since passed on, gave guild members this draft for an 8 shaft false damask. 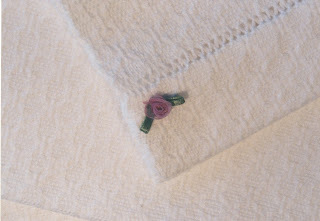 I made some kitchen towels featuring Gloria's favourite colour purple. I still have one towel and its in constant use in our kitchen and still looking good after eleven or twelve years. So what have I learned from this little wander down memory lane? (besides the fact we have moved a lot, but all for good reasons). 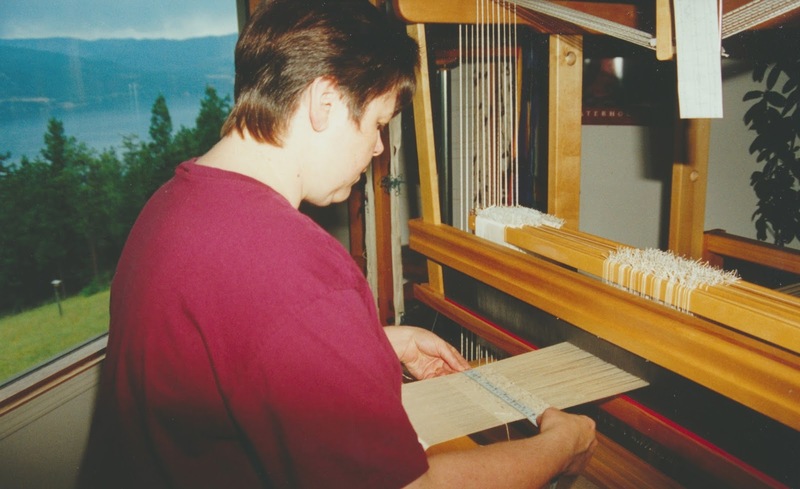 That I tried and traded up different looms as I grew as a weaver. Some worked and fit right and some were interesting to play with for a time and move them along to another weaver. 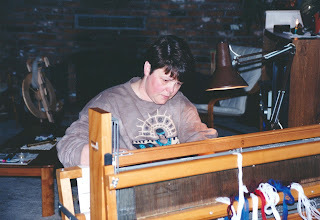 The loom swapping slowed down in time as I found the right fit for me. 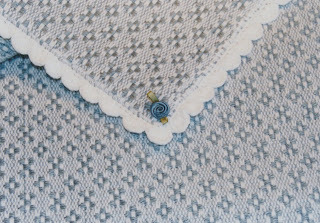 My later acquisitions of my Louet Spring are documented in this post, and my Louet Megado in this post. I also learned that our Province of BC is beautiful, one house move at a time! I think we're happy being Vancouver Islanders now having lived here for 8 years now. It always feels like home when the ferry is heading for her shores. We might just be finally setting down roots!